There is a good side to voter fraud. There really is a wonderfully good side to voter fraud. At least in California, in the 19th century. You see, when voter fraud is a real problem… or even a perceived possible problem… the Powers That Be tend to do something to crack down. They pass laws, and demand that one thing that all of us genealogists adore with all our hearts: paperwork. And so it was in California. In early 1866, the California Legislature was deeply concerned that the enormous influx of people to the Golden State — the population more than tripled between 1849 and 1860 — would lead to real problems in elections there. 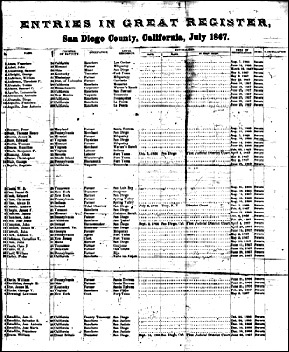 Take a look, for example, at the first page of the list for July of 1867 for San Diego County — chosen, of course, because that’s where I’ll be this Saturday, September 9, speaking at the San Diego Genealogical Society Fall Seminar at the Marina Village, Captain’s Room, 1936 Quivira Way, San Diego. (Yes, you can still register online, through Thursday.) You can find the printed volumes reproduced on Ancestry and an index on FamilySearch. You might expect to look for naturalization records of San Diego County residents in San Diego. But I’m not sure what else would clue you in to where to look for the naturalization record for, say, Andrew Cassidy, also on that same first page. He registered on 1 December 1866. He listed his occupation as tidal observer, his age as 36, his birthplace as Ireland… and said he’d been naturalized in the District Court in Troy, New York, on 2 July 1846.7 What’s intriguing about that, of course, is that 1866 minus 1846 is 20 years. And Andrew’s reported age of 36 minus 20 years means he was claiming to have been naturalized at the age of 16. That would have to be through his father, not on his own,8 so you’d know to look for another Cassidy there in New York. These Great Registers are really great registers… great for genealogical research in every possible way. Ooh, ooh! Did any other states provide Great Registers? Or a reasonable facsimile? The detail in the California Registers is just amazing. Thanks for mentioning these. I wish I had someone in California at that time. Enjoy San Diego. Not with this much detail that I’ve seen, no, but there are voting registers in some jurisdictions for some time periods so it’s always always worth checking. I ran across a ledger in a county historical society once in Virginia, and of course all the 1867 voter registrations of southern men. So check!! I was able to find clues to my great-great grandfather’s naturalization in Illinois based on the California voter registration of one of his sons! It was a thrill to see the actual naturalization papers in a visit to the Pike County IL courthouse as a result of this paper trail. Outstanding! Having these hints is so amazingly valuable!